A Link Belt 350 X4 and a Link Belt 245 X4 Spin Ace to clear debris on highway 70. The Carr fire, which spread from Shasta County through the town of Redding, burned for more than a month, from July 23 to Aug. 30. The blaze consumed 229,651 acres, destroyed more than 1,600 buildings, and killed eight people. Once it was contained, Redding Electric Utility called on Dragon Demolition to begin the cleanup. 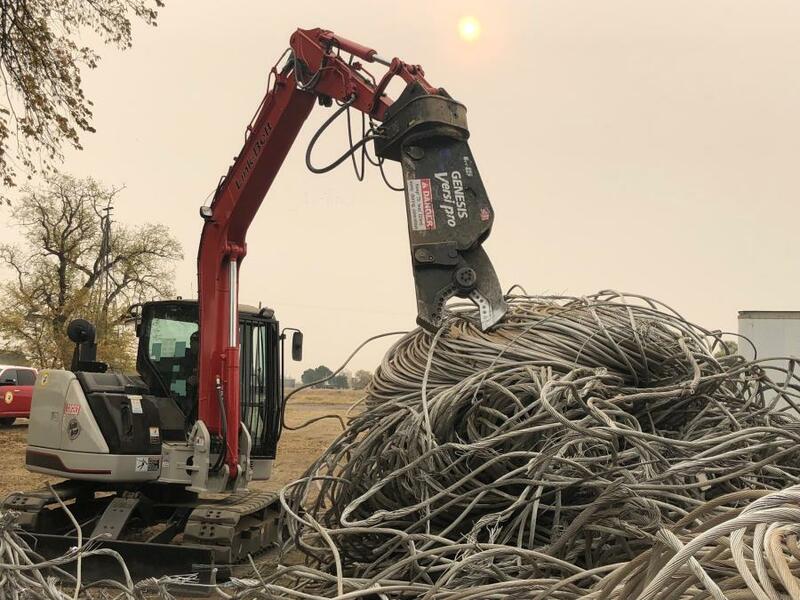 Based in nearby Chico, and with more than 20 years of experience in the demolition industry, Dragon Demolition has a reputation for expertise and efficiency, and owner Tom Carpenter wasted no time reaching out to Bejac for advice on which machines would accomplish the job as quickly as possible, most economically. "They have great rental department staff, a great service department, are easy to work with, and they recommend and have the appropriate equipment that is needed for the job," said Carpenter, who has worked with Bejac for almost a decade. "I put Bejac on the very top of my equipment needs." For Dragon, Kevin Broderick, territory account manager at Bejac, recommended two Link-Belt excavators: the massive 350 X4 and the nimble 80 X3 Ace. He knew the 350 X4 would be best for tackling the fallen trees and other debris. "At over 80,000 pounds and with more than 40,000 pounds of breakout force, the 350 X4 is a beast best suited for the grunt work," said Broderick. "It's there for the really heavy loading and lifting or pulling large trees up or down the slopes." For the more precise task of clearing and cutting the cables and wires, Broderick offered the smaller, 18,900 lb. 80 X3 Spin Ace coupled with a Genesis rotating Versi Pro 7 shear. "In order to cut the thin 1 inch cable, it was all that was needed for that particular job. Anything bigger would have been excessive and not cost effective," said Broderick. 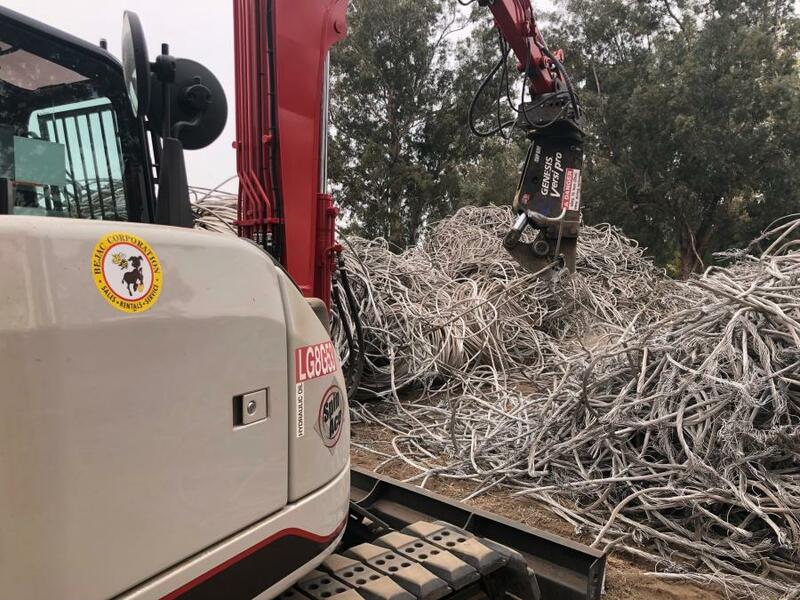 Despite one minor hiccup — a shear blade broke, but was promptly fixed, due to Bejac's immediate on-site service — 66 miles worth of cable was prepped for recycling in a matter of weeks, clearing the way for rebuilding to begin. Sadly, there was little respite for California. The even more catastrophic Camp Fire broke out in Paradise two months later. California's deadliest wild fire ever, the Camp Fire tore through 153,336 acres, consuming 18,804 structures, and claiming at least 85 lives. 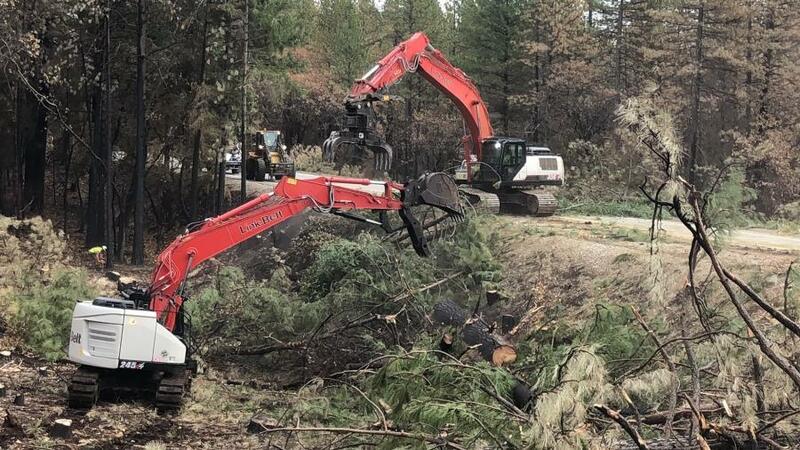 Again, Bejac was asked to assist, this time coordinating with a local contractor to dispatch another 350 X4, as well as Link-Belt's 245 X4 Spin Ace to clear debris on highway 70 into the Camp Fire. The 245 X4 is a compact unit with lots of power for lifting heavy objects and breakout force of 34,600 lb., but still a small footprint and no tail swing to interfere with traffic or take up precious road space, which is especially important when dealing with massive amounts of evacuees returning to survey damage, according to the manufacturer. In both cleanup scenarios, Broderick drew on his years of experience and understanding of the machines to recommend just the right equipment for each job. "All the machines selected for the fire clean up were chosen because they were the best tool for the specific application. Bejac has an extremely diverse product line of equipment and attachments, which is why so many specialty contractors depend on us for our knowledge." That's simply what Bejac does: help out at a moment's notice. For more information about Bejac, visit www.bejac.com.